Growing up, my mom loved fruit and always kept a variety in the house which she encouraged my brothers and I to eat. However, one fruit that was conspicuously absent was the apple. It was not the taste she didn’t like. Rather it was the sound of someone biting into one that bothered her. It was like fingernails on chalkboard and the sound literally gave her goosebumps and sent chills up her spine. Fortunately for me, I didn’t inherit this aversion as I do like to eat crunchy fresh apples, especially with peanut butter or caramel. 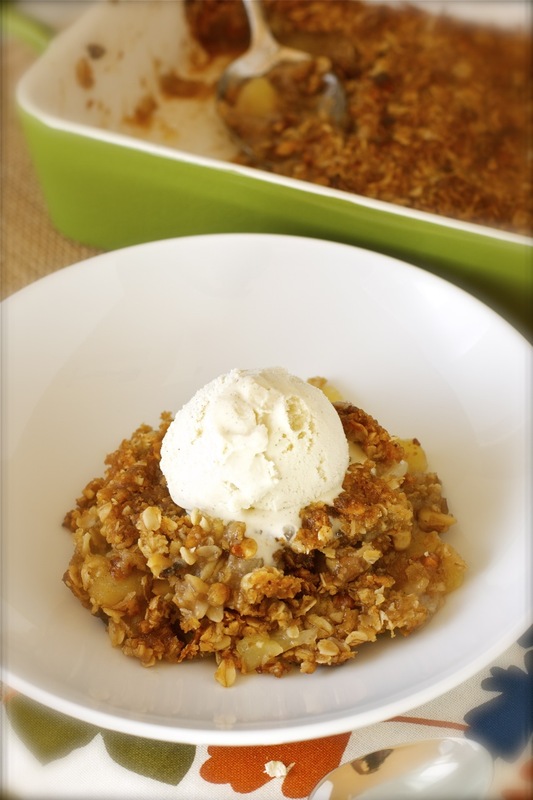 I do, however, prefer them cooked, in pies, tarts, or in this delicious apple crisp. The sweet-tart flavor of the apples pair very well with the warm spices and the crunchy, buttery oatmeal and walnut topping. Served warm with a scoop of vanilla ice cream, slowly melting and mixing with the topping and apples, I can’t think of anything better. Perhaps I should bake this for my mom. Even she might change her mind about apples. Peel, core, and cut the apples into 1/2-inch wedges and place in a bowl. Pour in lemon juice and toss to prevent browning. Add granulated sugar, cinnamon, flour, and vanilla extract and stir to combine. Transfer to a buttered 8-inch by 8-inch square or oval baking pan. Scatter the walnuts and pieces of butter on top of the apples. To make the topping, combine the oats, brown sugar, nuts, flour, salt, and spices. Cut in the butter using a pastry blender, a fork, or two knives. Spread the topping evenly over the apples. Bake until the topping is golden brown and the apples are bubbling, about 35 to 40 minutes. Cool slightly on a wire rack. 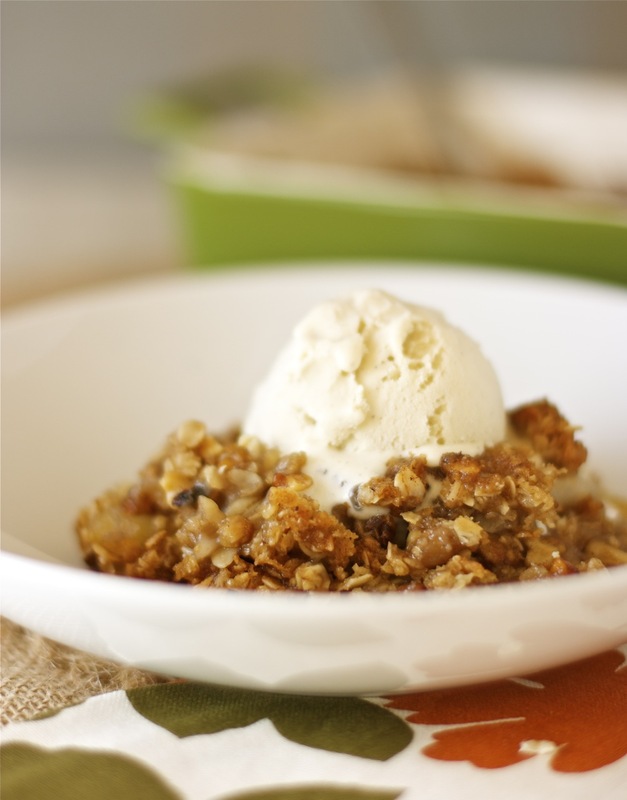 Spoon warm apple crisp into bowls and serve with vanilla ice cream. Somehow I missed this! Making it on Sunday(or maybe tomorrow). It would be the perfect ending for Sunday dinner. Or as a snack. Just pulled this out of the oven and am now waiting patiently for it to cool a bit before digging in. I substituted pecans for the walnuts and used a baking spice (cinnamon, clove, ginger, nutmeg, and allspice). The house smells wonderful. I was also pleased with the amount of topping – not too much or too little. Thanks for sharing your recipe! Hi Julie! Thanks for stopping by to let me know that you’re making apple crisp. Isn’t it delish? I hope your patience was rewarded! I am in heaven with the amazing scent of this cooking in my oven right now! I made it with gluten free flour and because I am a cinnamon addict, I doubled the amounts you gave. Thank you for a wonderful recipe!! That looks so flavoursome and autumnal, wonderful recipe, Daisy. Thanks, frugal! It’s nothing like autumn here, as it’s still hot!!!! That looks perfectly yummy. Oh, do I even have time to think about making that…..Bookmarked. Thanks, Janet! I’d love to see you make this gluten-free. What a great idea! I just added the option of using vanilla sugar to the recipe. I like the addition of the walnuts – I’ll have to give this one a try. Thank you for your comment and for visiting my blog. I hope you come back again.